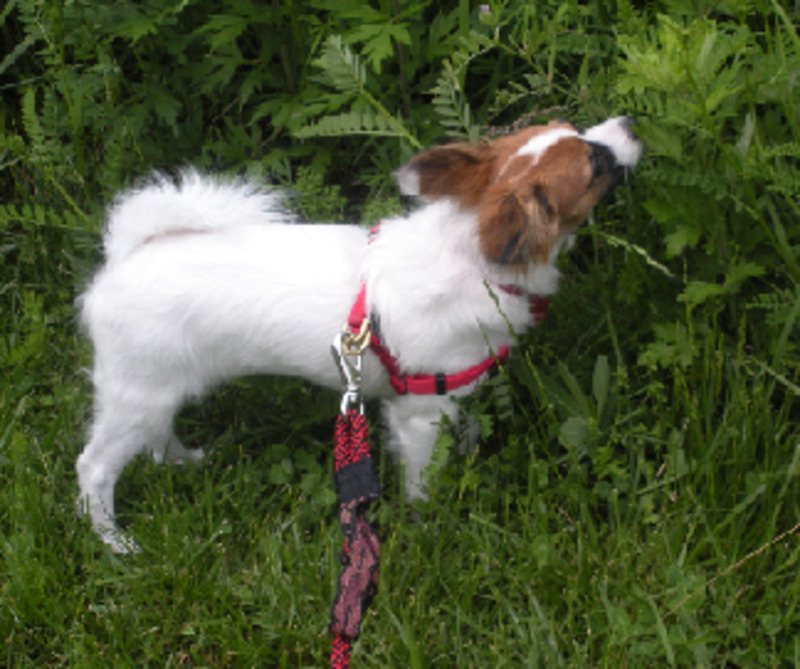 When I got my Jack Russell Terrier, there were so many things I had to adapt to. Besides having five times as much energy as my previous dog, a Lab/Golden mix, she was 60 lbs lighter. This meant rethinking dog treats. 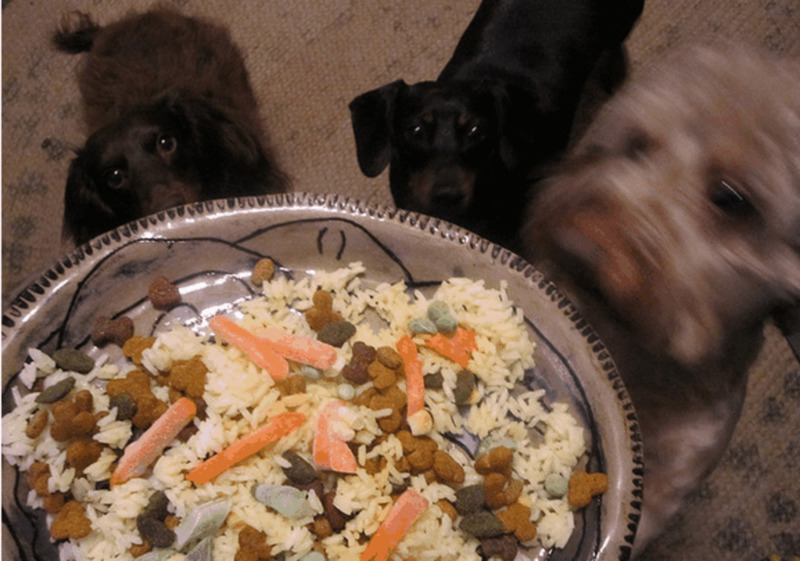 When it comes to food, small dogs have different needs than big dogs. They, also, have some limitations that need to be considered. It's important to find treats which are satisfying for your dog, but are good for them as well. It can be confusing with the sheer variety of treats on the market. Stand in the any dog treat aisle at the pet store and it's enough to cause a panic attack. If you keep a couple of things in mind, you'll be able to make the best selection. How Big is That Treat? 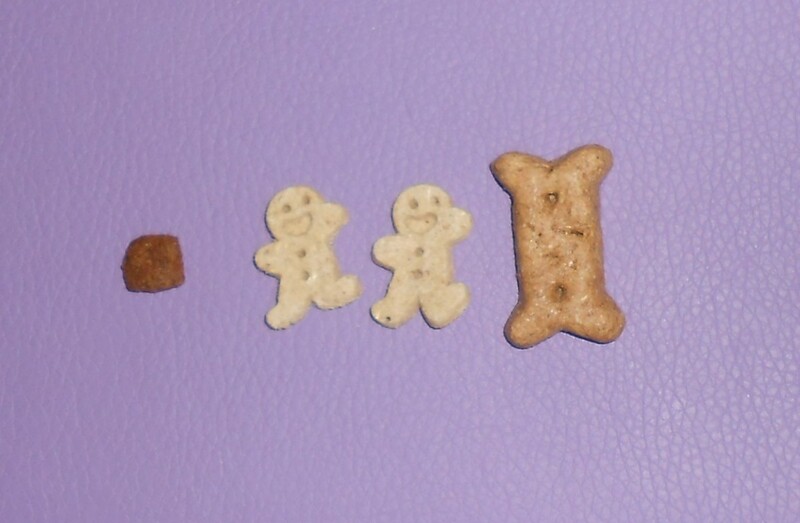 Many dog treats are heralded as hearty, chewy, and long lasting. But, they are meant for big dogs like German Shepherds not Chihuahuas. While my dog would love to eat a huge biscuit, it can be dangerous for her. Not only is it too much food at once, it can break off in big chunks that can choke her. Yes, I'm speaking from experience. Misha is terrified of our gardener. She barks the whole time he is working. To get past this, he decided to befriend her with bribes. The problem was what his dog bones were too big for Misha to chew. One week she swallowed too large a chunk and promptly threw it up. The next week she took too big a piece which got it stuck in the back of her mouth. I had to reach in and pry it out. After that, we keep a supply of appropriate sized bribes and hand them to the gardener when he arrives. Select small treats that are made specific for small dogs. Many companies make treats specially designed for toy breeds. These are perfect for smaller non-toy breeds as well. Misha tells me the Peanut Butter flavor is the best. But, she's open to all varieties. She loves these because they are small enough that sometimes she gets two at the same time. They are the perfect reward for my Jack Russell Terrier. 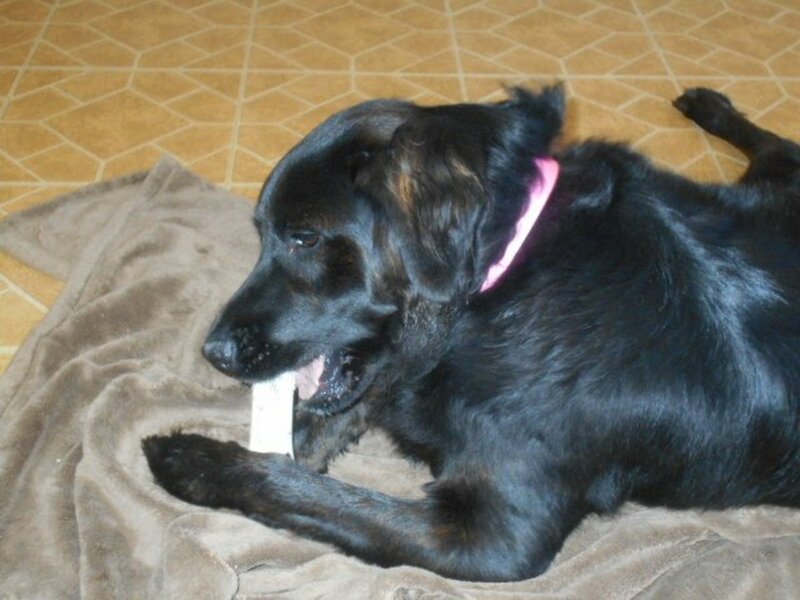 Can Your Dog Chew It? 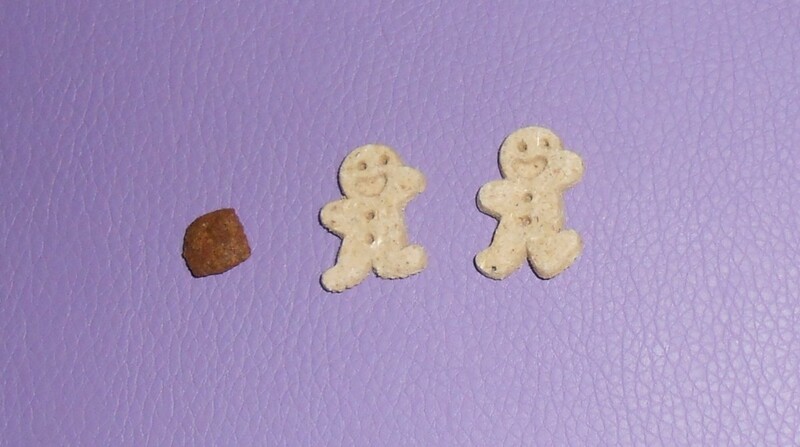 Even if the treats are small, they may be too hard for your Yorkie to chew through. Tiny teeth take tiny bites. You have to consider whether those teeth can break up food that is hard and thick. This doesn't mean you have to buy soft chews, though I'm sure your pup would love them. There are hard biscuit type treats that are thin enough that smaller jaws can get through them. There are some advantages to hard treats. They can help keep tartar at bay and add to overall oral health. Select hard treats that are crunchy but not too thick. The thickness is really the kicker. If it's too difficult to break with your hands, your pup won't be able to break it up either. Old Mother Hubbard makes dog bones in a mini size that are perfect for my 10 lb. dog. They break up in small enough sizes that I don't have to worry about choking. Also, I like the fact that they are easy to break by hand. I can make one treat seem like several. Do you find it difficult to find the right treats for your dog? 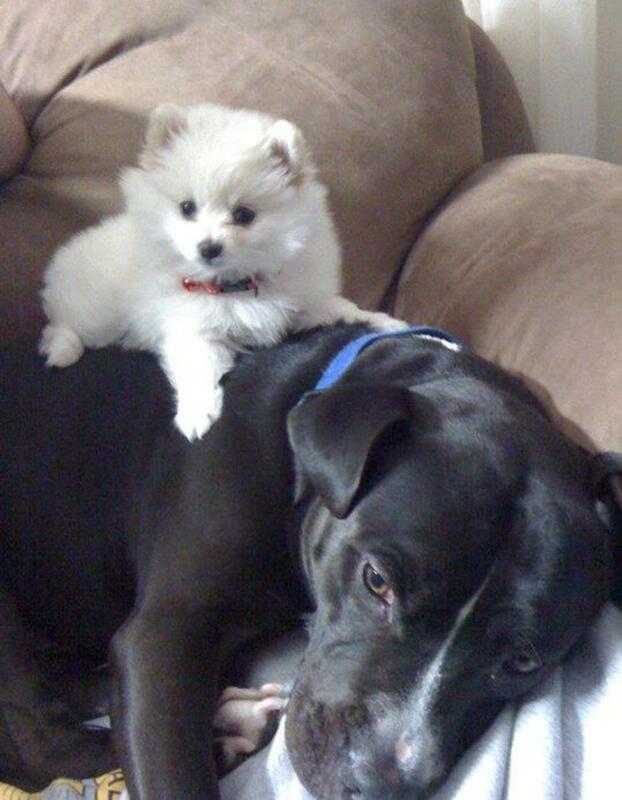 We all love to give our pups little snacks and rewards during the day no matter what their size. However, it can be very easy to treat a small dog too much. 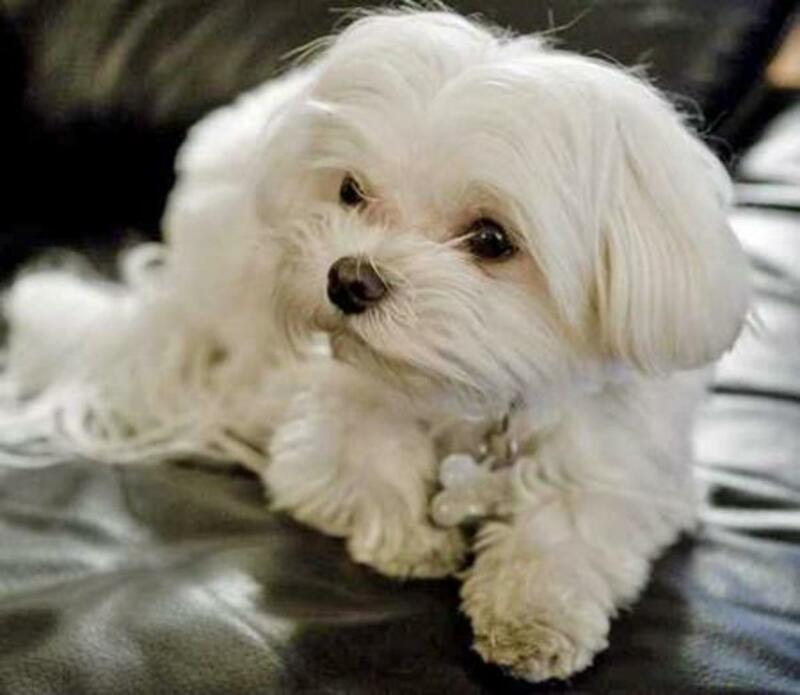 The difference between 7 lbs and 10 lbs doesn't seem like much, but it can be for a small breed. 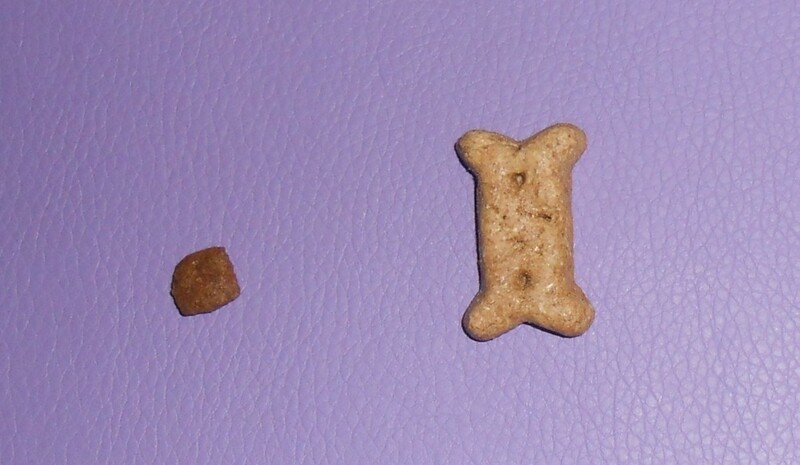 Two regular sized dog bones might be more than a 10 lb dog gets in an entire meal. Nobody wants to hear the words "your dog needs to lose weight" from the veterinarian. Trust me on that. In 2015, dog food manufacturers will have to include calorie counts on dog food bags, but they don't have to supply the information on dog treats. Without that basic information, how do you know what a serving size is or how many calories are in a bone? You don't. In this case, the smaller the better. For this reason, I like Buddy Biscuits, the Itty Bitty Size. They are only about an inch long and they're very thin. You can break them in half easily. I do this so my dog thinks she's getting more. Plus, they fit right in her treat ball. Old Mother Hubbard treats come in just the right size for dogs under 10 lbs. They are hard, but easy to break up and they come in a variety of flavors. I wasn't sure myself, so I did some snooping. It turns out that the FDA regulates dog food and treats just as it does people food. The FDA regulates what each manufacturer puts on its labels. Prior to 2007, this information was fairly basic. They had to identify the name of business making or distributing the product and list the ingredients in each product. According to the FDA Amendments Act of 2007, the regulations extended to defining standards for the ingredients used in dog food that are listed on the label and setting standards for processing. They also check into health claims much like they do our food. If a product says that it protects teeth against tartar, they have to follow specific guidelines that allow that type of labeling. As humans treat their pets more like family members, I suspect you will see dog food regulation coming more in line with people food. We spend a lot of money protecting our dogs' health. We want to make sure the food we buy serves that need. As a side note, not all regulation falls on the FDA. Some states have their own regulations. For more information on this topic, see the FDA's article titled “Pet Food”. If you buy treats that fit those guidelines, you'll be able to reward your dog without worrying about choking hazards or weight gain. And, you'll have one very happy dog. Is it too big for my dog's mouth? Can my dog chew through it? Will it upset my dog's diet? My young small pup has no teeth. What kind of treats do you recommend? Though my dog doesn't have this issue, I believe the best treats would be soft treats. Hard dog treats need to be chewed to be broken up. Soft, chewy treats can be swallowed without problem. Buddy Biscuits makes a line of soft & chewy treats. They can be broken into smaller pieces easily. They come in several varieties. My dog loves the peanut butter. So I buy Fromm food and I've always bought their treats but the first couple of bags I bought the treats were so hard that I couldn't even break them in half. My dog didn't seem to have a problem chewing them though, but I'm wondering if she could break a tooth on these? The most recent bag I bought I could easily break them in half. I'm wondering if they reformulated them because seem much better. The only other thing I could think of is the way I was storing them, they could have gotten stale. (In a sealed glass jar) I store them in the original bag now. The reason I stuck with these treats is because they are so healthy and only contain meat and veggies along with some flour to hold the biscuit together. I love that they include a ton of fresh produce! I have tried mother Hubbard biscuits and they were actually the prefect size and texture! And I loved that they were only 8 calories! Not quite as healthy as fromms though. But if the fromms doesn't work out, mother Hubbard is my back up. Thanks for the heart article! Ladyguitarpicker, thanks for your comments! It isn't easy finding the right treats for small dogs. They gain weight so easily! I'm glad you found a dietary solution and your beagle has lost 4 pounds. Smine77, thanks for your comment. I'm glad that your dog is okay. Treat time can be dangerous for small dogs, especially if you have one like mine who hasn't mastered the art of chewing. Thank you. This was very useful for me and I do relate. My dog threw up one of his treats that my friend gave him on a friendly visit. After that, I make sure to watch him while he eats his treat. It sure is! That's why I think we tend to overindulge them a little too much. We just love them too much. revolutionbjj, I haven't tried green beans. However, I've given Misha cooked baby carrots, broccoli, peas, and other veggies. She just loves them! 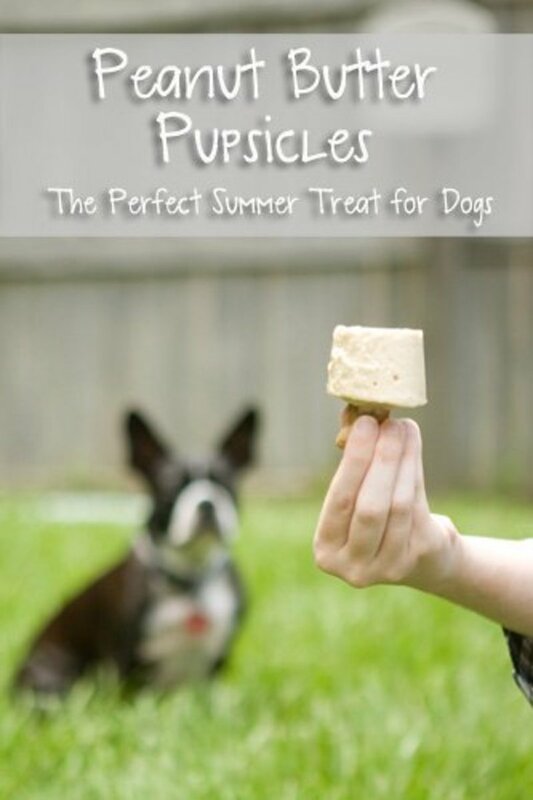 They are a great option for healthy treats that are easy for small dogs to chew. Thanks, mySuccess8! You're right, sometimes it is the obvious things we miss. Very good stuff. Have you ever tried frozen (cooked) green beans? These work great for diabetic dogs, or for dogs with low calorie needs! Very useful guides, which can sometimes be overlooked because some may seem obvious. Congrats on HotD! CONGRATULATIONS on winning Hub of the Day, MelRootsNWrites! Thanks Jim! What is about dogs and peanut butter? My Jack Russell will do anything for peanut butter. It's our secret go to when she won't take medication. Marlene, thank you! I can tell you that it's pretty scary when they start choking on a big chunk. Never knew I could react so quickly! My dog's problem is she doesn't chew them so it's even more of a danger. Susan, thank you! Yes, those big sad eyes can work out a treat or two, can't they? That's why the Buddy Biscuits are so good. I treat Misha with vegetables too. She really loves steamed baby carrots. Katya, thanks! I'm glad you liked the photos. I'm surprised there aren't more options on the market since there are so many small dogs in homes. Even with some of the stuff out there, it's just not good quality. Corrinna-Johnson, Thank you! 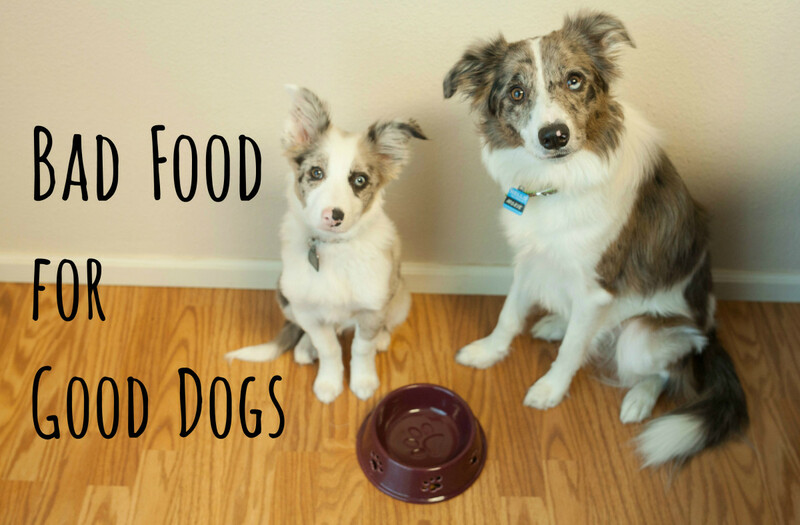 Homemade is an excellent way to make sure your little dog is getting the best snacks. Thank you Pawpawwrites and BarbaraCasey! Hopefully, the information will come in handy. Thanks aka-rms! I would stick with what works especially with a picky dog. Misha will eat anything as long as it looks kind of like food. Phyllis, 6 pounds is so small! The Itty Bitty Buddy treats would be perfect for your Pom. They are really small and thin. Some very good advice here! We supplement store bought treats (U.S. made only) with homemade dog cookies. Our pooch friends love the cheese and peanut butter varieties especially, plus they are fun to make and cut out with dog-related cookie cutters (bone shape, fire hydrant, mailman...etc.) Congrats on HOTD! Congrats on the HOTD! Thanks for sharing the information. I have a dog, too. Happy weekend! Good tips! I've got big ol' 70+ pound golden retrievers which will try to eat anything... and I mean anything. 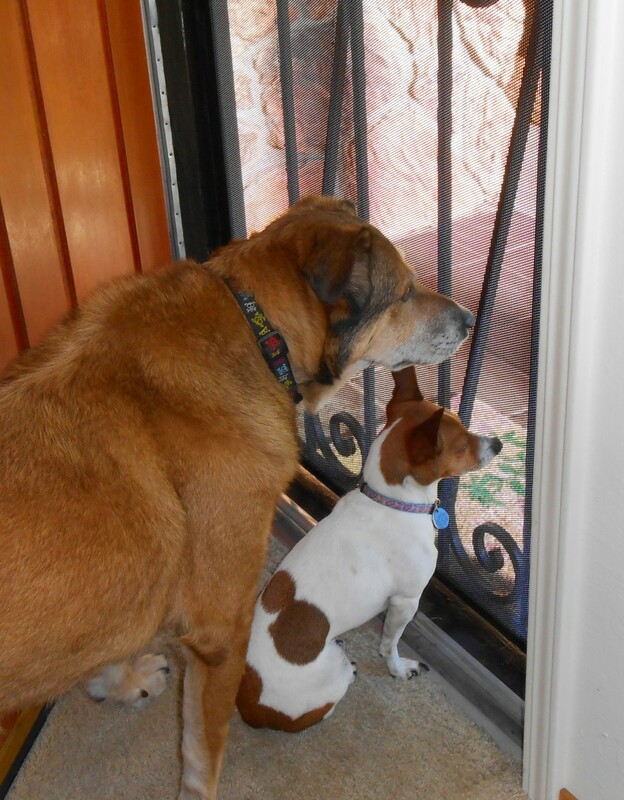 But I even have to watch it with them, especially when giving treats while on a walk. They get bitty cookies and cookie crumbs as a motivational treat to keep walking politely. Voted up and useful! @gottaloveit - I would recommend making your own dog treats so you know what's in them and don't have to worry. I had two little terriers who loved to eat pig ears. When one would finish eating her pig ear, she would attack the other dog to get a piece of the other dog's pig ear. They really liked their pig ears, but they became so violent over the pig ears that I had to stop "treating" them with pig ears. Now after reading your hub, I see I was lucky they didn't choke on them because the pig ears were quite large for those little dogs. Moving forward, I'm going to look for treats that are more appropriate for the size of the dog. Thank you for such valuable information. And, by the way, congratulations on receiving Hub of the Day! It really is difficult to choose treats for dogs. Our Daisy is big (80 pounds) and loves to get treats. I'm a softie, so I tend to buy small to medium-sized treats so she thinks she's getting more than she is through the day when I give in to her pleading and big, golden eyes. Congrats on your HOTD honors today! Great article. It is more difficult to find treats for a smaller dog. This hub has great advice for finding the right kind. Thank you for your insight. The pictures were great too! The treats look like cookies! Yum! Congratulations on being rewarded for this hub! I have a little 8 pound Chihuahua and most of the store bought treats are not suitable for her so I make mine own. I am control of both the quality and the size :) Congrats on HotD! Very clear, well written info. Congrats on HotD! This is great information for any dog owner. My picky little dog only likes certain treats so we stick with those. Congratulations on HotD! Melody, thank you so much for writing this hub. I have a heck of a time finding treats for my tiny Pom, 6 pounds. I am going to try to find the itty bitty buddy treats. Thanks again. Thanks Sandy! I really had to learn a lot going from a 70+ lb Lab to a very small Jack Russell. A very useful hub indeed as I have a small dog. Can't go wrong with peanut butter treats. Misha swears by them. I know, aren't they? My sister and I laughed about them because she has a 60 lb. dog. The Buddy Biscuits she buys are about 4 times the size. 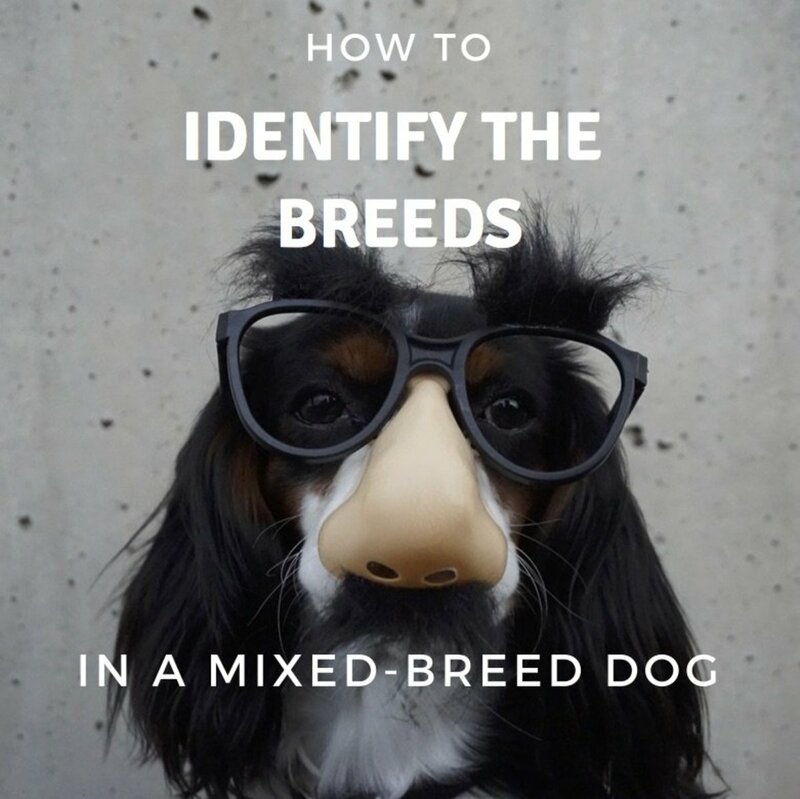 Great information for all small dog owners! mighthub, I used to give my Lab/Golden these special treats with minimal ingredients. Poor Misha couldn't even chew through them. It was like giving her rocks. Thanks for sharing this. I too had trouble figuring out which treats were best for my little pug. GottaLoveit2, I share your concern. While the Old Mother Hubbard treats are made in Canada, Buddy Biscuits are made in the USA. I'm having a hard time finding dog treats made in the US - I refuse to buy foreign made treats. Those itty bitty buddy treats are so cute. I bet dog love eating them! Can't comment on dog treats. This is cat country here. But I do know you have a nice, clean looking lens. Well done.